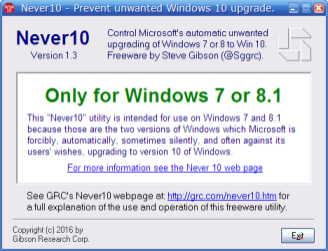 This is an excellent tool that I seem to have stumbled upon, Never10 is a lightweight software patch that keeps your computer from upgrading itself or forcing you to upgrade to Windows 10. Microsoft has done it again by decreasing the amount of trust Consumers have towards Microsoft Users. It has been discovered that Microsoft is conning Windows users by tricking them into upgrading their Operating System from Windows 7/8/8.1 up to Windows 10 when all they remember is that they clicked the close button to keep this from actually happening!